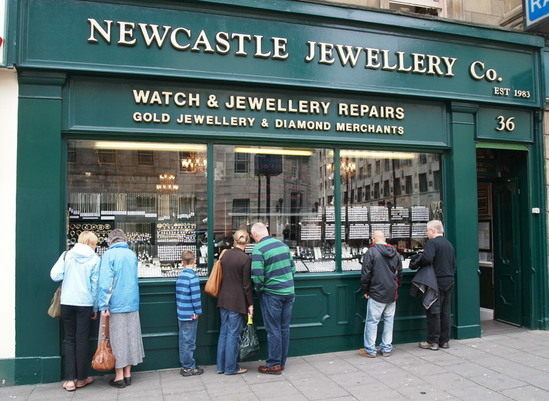 NOT US THE NEWCASTLE JEWELLERY COMPANY. the Full Depth of Selection On Show. & We Will Also Buy Your Unwanted Gold & Silver For Scrap. No loans offered are under 60 days and all loans have a maximum APR of 65.7%. Early prepayment options that are available are not associated with any fees or cost. "I am speechless at how much I got for my old gold £401"
well worth the visit and very pleasant staff"
jewellery at Newcastle Jewellery Company"
I visited a Jewellers in Morpeth, I was offered £540 for my mixture of unwanted gold and silver, At Newcastle Jewellers I was offered £1182 - I cant believe I have been given £642 more! We are situated at the rear of Newcastle's Theatre Royal. Opposite the old Police Station, on the Corner of Market Street and Pilgrim Street. See Our Find Us Section For More Information.